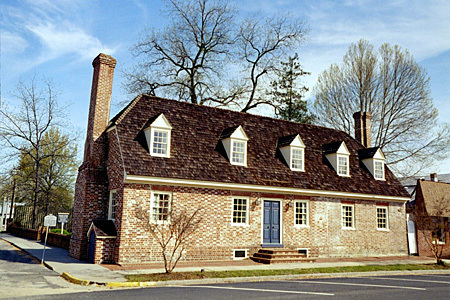 Ritchie-Meriwether House: This brick home is located on the corner of Prince and Cross Streets and across from the Old Clerk's Office. The present building is the western-most of what was once three or more brick buildings, all of which were connected by covered passageways, as a drawing of the structures was found in the Archives of the Virginia State Library. In 1706 Thomas Meriwether purchased 12 one-half acre lots in the Town. He was required to build a finished 20-foot structure on the lots within a year or the title would be escheated. 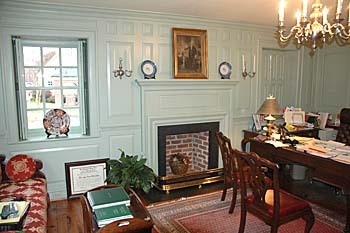 Since he willed his home at his death in 1708, he still owned the land area; and court references soon after this time refer to "Meriwether's Dwelling House commonly called thee Long House on the Great (Prince) Street." These buildings passed through several ownerships and were used not only as a dwelling, but a store, ordinary, and tavern by the Banks Family. In 1768 Archibald Ritchie, the father of the famous editor Thomas Ritchie who was born here in 1778, purchased the entire square which is bordered by Prince, Cross, Queen Streets, and Water Lane. There was at this time and up to the Ritchie sale in 1805 a substantial brick wall around the entire property; fragments and foundations are in evidence to this day. At the 1805 sale, brick buildings 225 feet long (Meriwether's Long House) were advertised besides the necessary out buildings, stables, and a barn. 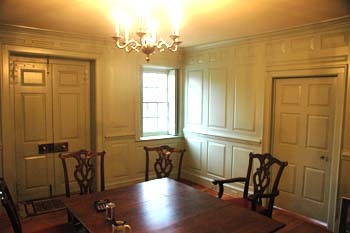 The original paneling is now in the DuPont Winterthur Museum at Wilmington, DE, and is known as the Tappahannock Room. The remaining part of the structures was once the private home of Mr. and Mrs. William Dandridge Andrews, is now the law offices of Dillard and Katona Attorneys and may be open by appointment.